Sarasota, FL - Master the art of cinematic lighting. 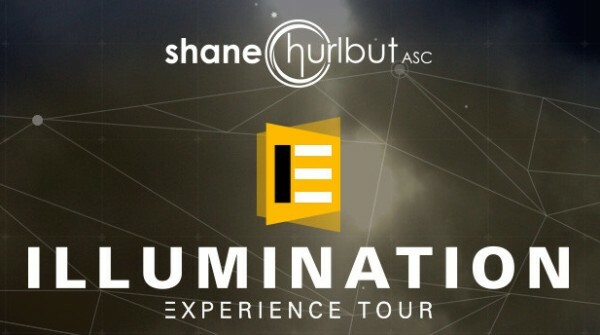 Sign up now to attend Shane Hurlbut's "The Illumination Experience." The 25-city tour will be on-the-road through November 17, 2014. WEVA members receive discount registration, plus an exclusive Bonus Discount on MZed's Filmmaking Training (see WEVA email Blasts for further discount details). Watch The Illumination Experience trailer. The Illumination Experience is a 2-part series; the Illumination Workshop, which will be taught at each city-stop, and the Experience Masterclass which will be available to attendees in eight of the 25 cities on the tour. For the Illumination Workshop, Shane will demonstrate his avant-garde approach to three-point lighting during an interactive live shoot. Divided into three phases: discovery, creation, and execution, Shane’s students will confidentially design, develop, enhance, and supplement the storytelling process with lighting, script analysis, storyboard preparation, lighting schematics, and shot lists. The Experience Masterclass is a day-long hands-on intensive consisting of two live shoots. The class will be divided into four teams. The teams will follow Shane’s lighting schematics to re-create film scenes from Crazy/Beautiful (2001) and Swing Vote (2008). With Shane’s guidance, students will learn to integrate methodical lighting with precise camera motion to achieve impactful results. Shane Hurlbut, A.S.C., is a world-renowned cinematographer who has shot multimillion dollar blockbuster films such as Act of Valor, Drumline, Terminator: Salvation, The Rat Pack, and We Are Marshall. Shane Hurlbut is a member of the prestigious American Society of Cinematographers and The Academy of Motion Picture Arts and Sciences. He is among a select group of cinematographers recognized by Canon as an "Explorer of Light" and by the Tiffen Company as an "ImageMaker". As an innovative cinematic pioneer Shane shares his passion for filmmaking through his educational blog, Hurlbut Visuals as well as the newly launched Shane’s Inner Circle. The Illumination Experience is produced by MZed. Their past tours include The Art of Visual Storytelling Tour with Oscar Nominated DP for the Saturday Night Live Film Unit Alex Buono, Three-time Cannes Lions award-winner Vincent Laforet’s Directing Motion Tour, and Emmy-nominated editor for the Saturday Night Live Film Unit Adam Epstein’s Cutting Edge Tour. As the worldwide trade association for professionals who film weddings and events, WEVA leads with education that's on the cutting-edge of new trends and technologies in our industry. WEVA members enjoy exclusive access to cost-saving benefits and professional development resources. Become a WEVA member today at www.JoinWEVA.com. For more information email info@weva.com and find WEVA on facebook. Follow @WEVAnews on twitter.